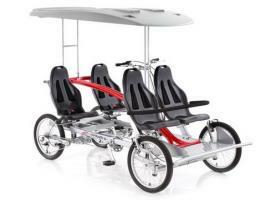 At leading resorts around the world, Surrey quadricycles are used for guest rentals. 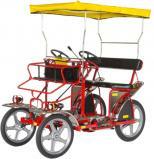 These four wheel Bicycle-Cars are lots of fun for the entire family. So many people who rode these cycles while on vacation would inquire about purchasing a Surrey for their own personal use. However, for consumer use, the price was fairly steep. We now offer the a solution! TWO GRADES OF SURREYS: (1) Professional Grade Surreys are magnificent machines. We recommend these models for those businesses using the vehicles for rentals and commercial purposes. For the consumer market, for the first time, we present (2) Economy Level Surreys, imported from Asia. They look and ride a lot like the Pro models, at a fraction of the price, making surrey ownership affordable for personal use. PLEASE NOTE! All surreys ship via truck and require considerable assembly. All Surreys are sure to deliver family fun for years and years. While we are not the manufacturer of the Surreys shown, we have many years of experience selling these machines to customers around the world. Now In Stock for immediate delivery..... the hottest performance quad on the market!